This lotion contains a blend of 7 natural organic essential oils and chili pepper that are recognized in the treatment of inflammation and pain. Options: 4 oz. 8 oz. 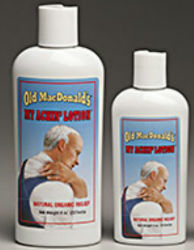 My Achin’ Lotion loosens and relieves tight, sore muscles and joints, and is great for strains, backaches, and sprains. Provides fast, long-lasting pain relief and is non-greasy with no artificial fragrance.